George the Dragon Slayer LE German Beer Stein ONE Mug Made in Germany New. This beautiful beer stein was handcrafted in Germany by Zoeller & Born. This attractive stein has a pewter lid. The handpainted stoneware relief shows Saint George on a horse fighting a dragon. A story is written on the bottom of the stein and it says: A town was terrorised by a dragon. A young princess was offered to the dragon and when George heard about this he rode into the village, slayed the dragon and rescued the princess. Limited edition of 5,000 pieces. This 1/2 liter stein is about 9.5 inches tall. This part number consists of ONE stein. Zoeller and Born is a family owned operation that has been producing high quality beer steins since 1956. They specialize in steins with stunning handpainted relief. Zoeller and Born is one of only a few remaining German stein companies that still produce their steins in Germany with 100% German materials and German labor. Thank your for visiting our listing. DecorationWarehouse and Home and Holiday Shops appreciates your business! 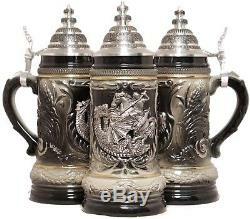 George the Dragon Slayer LE German Beer Stein ONE Mug Made in Germany New" is in sale since Saturday, August 11, 2018. This item is in the category "Collectibles\Breweriana, Beer\Drinkware, Steins\Lidded Steins\Germany". The seller is "decorationwarehouse" and is located in Tempe, AZ. This item can be shipped to United States, Canada, United Kingdom, Denmark, Romania, Slovakia, Bulgaria, Czech republic, Finland, Hungary, Latvia, Lithuania, Malta, Estonia, Australia, Greece, Portugal, Cyprus, Slovenia, Japan, China, Sweden, South Korea, Indonesia, Taiwan, South africa, Thailand, Belgium, France, Hong Kong, Ireland, Netherlands, Poland, Spain, Italy, Germany, Austria, Israel, Mexico, New Zealand, Philippines, Singapore, Switzerland, Norway, Ukraine, United arab emirates, Qatar, Kuwait, Bahrain, Croatia, Malaysia, Brazil, Chile, Colombia, Costa rica, Dominican republic, Panama, Trinidad and tobago, Guatemala, El salvador, Honduras, Jamaica, Antigua and barbuda, Aruba, Belize, Dominica, Grenada, Saint kitts and nevis, Saint lucia, Montserrat, Turks and caicos islands, Barbados, Bangladesh, Bermuda, Brunei darussalam, Bolivia, Ecuador, Egypt, French guiana, Guernsey, Gibraltar, Guadeloupe, Iceland, Jersey, Jordan, Cambodia, Cayman islands, Liechtenstein, Sri lanka, Luxembourg, Monaco, Macao, Martinique, Maldives, Nicaragua, Oman, Peru, Pakistan, Paraguay, Reunion.